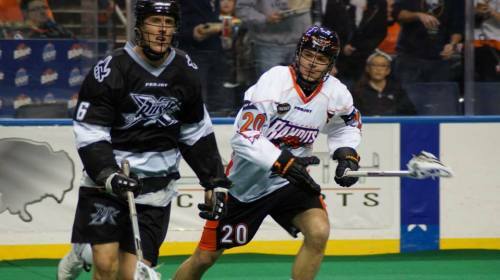 In a rematch of one of the more entertaining games this year, the Buffalo Bandits host the Vancouver Stealth at the First Niagara Center. Both teams are making a push for the playoffs, with the Bandits firmly in third place of the East Division. Vancouver comes into the game with a 5-11 record and last place in the West with a game in hand on Calgary. With the Roughnecks on a bye, next week’s showdown will be a playoff primer, with the winner taking on Colorado in the first round. Buffalo’s Dhane Smith had a fantastic performance in the first meeting, eviscerating the leaky Stealth defense and getting to the cage at will. The key will be to shut down Smith while keeping focus on the other Bandits shooters – if they pay too much attention to Smith, Ryan Benesch will gladly add to his 44 goal total. The Stealth lost again last week when they hosted the Rochester Knighthawks, their seventh loss in eight games. As they try to stem the bleeding, goaltender Eric Penney will be relied upon to give the Stealth O some support in between the pipes. With the playoffs all but a formality for Buffalo, it could mean the Stealth have a chance to steal one on the road and gain some momentum when they host Calgary on May 2.